Best Time to Buy a House? Will 2018 Bring Another Housing Boom in Toronto and Vancouver? Are the Vancouver real estate market or Toronto housing market going to crash , lift off, or coast in 2018/2019? Has all the negative press made you believe the end is near? Bankers and politicians keep trash talkin the housing markets. However, as you’ll read here, there is more reason to believe in strong growth arising from a healthy economy, high immigration, demand from 25 to 33 year old Millennials, low mortgage rates, a growing housing crisis and more. Demand is high, supply is being strangled. Wynne, Trudeau, and the bankers feel pretty certain they can crush this market (okay, they’ve persisted but will the Canadian economy and stock markets crash in 2019? But this beast isn’t going to die. It’s driven by dreams and expectations about how we’re supposed to live. Here’s my outrageous forecast: The demand is so high, they will have to completely reverse course and begin supporting construction and development and enabling purchases. Otherwise, as the election nears, they’re gone. They’ll look like hypocrites, but the public will forgive because housing is a bigger issue that’s causing serious social troubles. As investors focus on rental properties, such as apartments in Toronto, even rents will skyrocket in Toronto. Toronto property management firms are headed for their own boomtimes. As spring approaches, we’re going to see intense price pressure driven by a lack of supply. Royal Lepage just released its market forecast survey and they’re predicting Toronto houses prices will rise 6.8%. That aligns nicely with this whole notion of boom times ahead. And it turns out, construction is already booming. Canada Mortgage and Housing Corp. reported that the pace of housing starts picked up in November nearing the highest levels since 2008. Given that we just went through a boom, that’s remarkable. CMHC believes construction of multiple-unit projects in Toronto has been a driving force behind the trend. Benjamin Tal is also suggesting a boom in Toronto and Vancouver and it would restart in 2018. You can read more below. Should you buy now or in the spring? 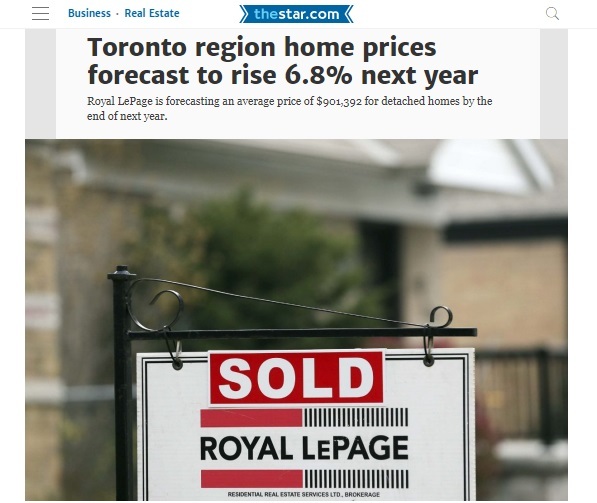 Take a good look at the Toronto real estate forecast and the further reading below. 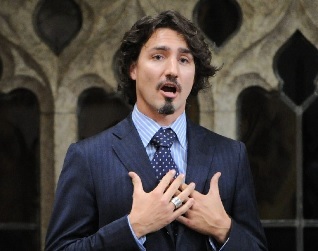 Breaking News: Trudeau to bring in one million new immigrants in next 3 years. Question: where will they live? Despite government negativity, statistics, the underlying fundamentals of demand along with the ongoing strength of the economy are suggesting an improvement. That means a prison riot might be coming soon. You’ll find a list of credible reasons why the Canadian housing markets might surge again below. The experts have been forecasting a Toronto or Vancouver crash now for many years. Hasn’t happened, so perhaps we need to think for ourselves? The market continues with confidence and optimism overpowering persistent negativity the politicians keep pushing out. How is the US housing market doing? Nervous but very good. Post hurricanes and fires and political upheaval, the markets in Miami, Boston, New York, Houston and Los Angeles are healthy. And 2018 stock market predictions are positive for several years. Let’s take a look at the factors and the two opponents: our politicians vs strong growing economies. Only one will win. Let the Housing Good Times Roll! The IMF and OECD seem to agree, saying Canada’s economy is the best looking in the G20. The case for a Canadian housing boom has some wind in its sails. If political suppression of the Toronto and Vancouver housing markets were to end, the rest of Canada would awaken. What we don’t know is whether the government will attack the momentum or let it power the economy further. Currently they’re riding a wave of populism driven by angry renters in Vancouver and Toronto. But what if that voice faded and the exact opposite public opinion appeared? Justin Trudeau’s popularity has dropped to 25%, Wynne’s pushing towards zero, and that means they may have to reverse course to stay in office. Don’t believe they would do it? Never say never. Currently however, Wynne, Trudeau and Horgan are holding their own private “let the good times roll” party. Their unwise meddling in the housing market is a threat to the Canadian, BC, and Ontario economies as explained below. And it’s all for political points that may soon be worth nothing because when you cater to a small select crowd, eventually everyone else wants you out. In truth, only the prices of million dollar estates have dropped a little and the rest of Canada is hurting. Demand for housing is relentless and Millennials don’t want their dreams dashed. The larger voice will be heard in 2018. People want homes and these 3 politicans will be booted out of office because of it. The only ones voting for them are those in Toronto and Vancouver cities. The rest of the country wants to see lower mortgage rates and an improved economy. A good number of Canadians are weighed down by thoughts of the last recession rollercoaster and don’t really want to go back there. Business people and investors want growth. They’ve got a lot on the line. And the politicians they’ve discouraged the builders now. So, although everything is in place for a continued housing boom in Canada, these politicians could push us into a mess. “At this point we do not see any real relief. In fact, the opposite is the case,” writes Tal. “Without significant changes to land and rental policies alongside a dramatic change to housing preference among buyers, those centers will become even less affordable.” – Benjamin Tal in an interview with Yahoo Finance. Benjamin Tal may have meant a price boom is imminent because of severe shortages in the Vancouver housing market and the Toronto housing market. 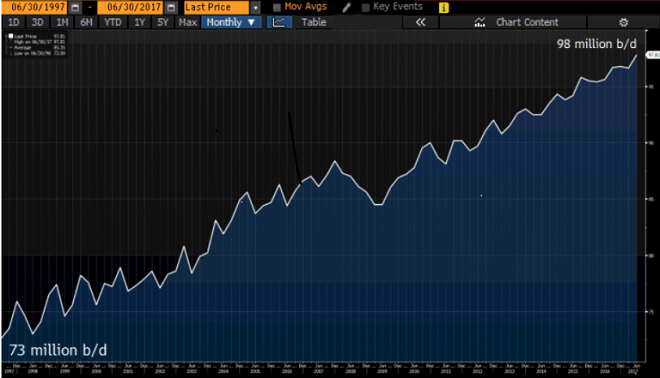 And if prices rise, we may see construction starts also slowly rise and a juiced up housing market would in turn lift the Canadian economy higher. A synchronized global recovery and rising global trade volumes are backstopping the growth, along with the bottoming out of the oil shock in western Canada and soaring home prices in Toronto and Vancouver — from a report in the Toronto Star. 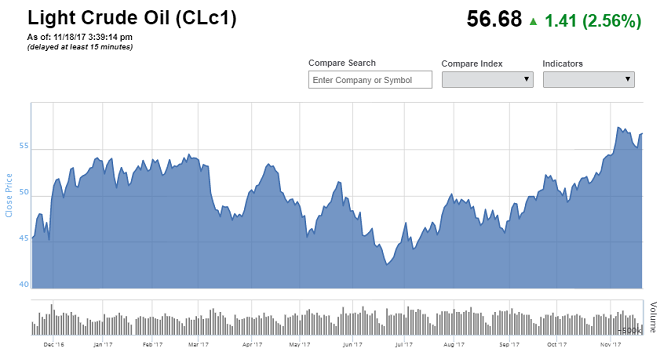 And prices of oil have climbed, meaning Calgary’s real estate market and those in Edmonton, Saskatoon and Regina might return as well. Fears are that OPEC is solidifying and a war between the 2 biggest producers could erupt. That would bring an immediate boom to Calgary. This is a screenshot below is of historic oil consumption from Doug Rowatt’s post on the greaterfool.ca. The price is forever upward. Is the time time oil shoots toward $100 a barrel? Some are predicting it. Forecasters like Oil: “Open interest in $100 call options for December 2018 has tripled in one week to exceed 30,000 lots, according to Reuters. The $100 December 2018 options is the largest strike for all of 2018.” — from USA today report. Condo starts have been strong and look to continue. The Toronto condo market and Vancouver condo market will be driven by property investors according to reports. BNN’s Greg Bonnell Interviews Bryan Yu, Senior Economist at Central 1 Credit Union regarding Vancouver’s perpetual positive market in a past interview. What stands out about the conversation is that Yu says affordability won’t affect prices, and that only an external factor, such as a Chinese implosion would create a Vancouver slowdown. At this point, with Trump’s visit to China, that the Chinese are adapting to global business and are welcoming foreign investment. No reason for a China problem. Vancouver looks great. 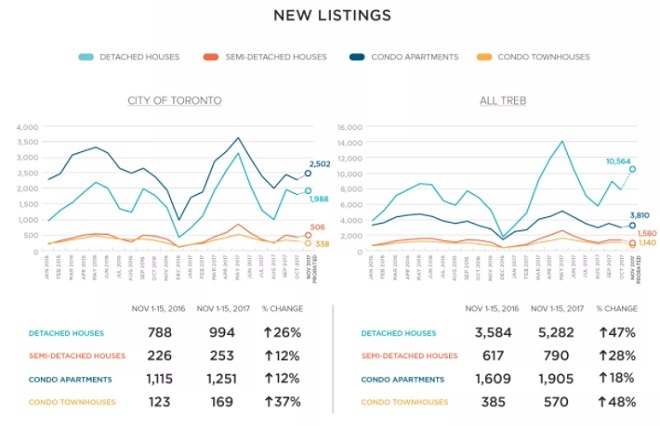 What makes Toronto’s condos an attractive long-term bet is the city’s low vacancy rate, which has fueled bidding wars among renters and driven monthly condo rents to an average of $2,074 in the second quarter, up 7.2 per cent from $1,935 a year ago, according to market research firm Urbanation. — from a report by Bnn.ca. Severe shortages are likely to drive home prices high. Most forecasts and expert predictions are for a flat market for 2018. Yet the economy is strong and looks to get stronger so a flat market is really about sales volume. Prices are so high no can afford to buy houses in Vancouver or Toronto and soon for condos. It’s a seller’s market in 2017 and 2018, and with rent controls suppressing new construction, the pressure will build to create higher prices of resale homes and condos. As wild as Benjamin Tal’s prediction is, it jives with what’s going on in the economy. Douglas Porter believes the market will heat up too, but his view is that it will end with a housing market crash. If NAFTA talks go well, which they likely will, the North American and global economies will both grow. That doesn’t fit with some bankers and politicians wishful prognosis of stagnant or reduced prices in 2018/2019. The latest numbers from Novembers mid month report by ZooCasa shows a surge of listings this month. This rapid rise in listings in houses and townhouses tells us sellers might be too desperate, overestimating the effect of mortgage stress test changes, and clearly not of the view that the market will climb in spring. In TREB’s monthly price charts, prices in the core districts of Toronto haven’t fallen. The demand for homes within commuting distance of jobs is high and buyers will likely pay any price. Home prices in the 905 area code have fallen (York Region, Mississauga), but perhaps that’s ready to heat up in 2018. There are still bidding wars and lots of over asking sales happening. Let’s not forget that many renters and some homeowners will have to leave their current homes, and they will be exposed to a zero vacancy market you normally associate with New York City or San Francisco. Does This Fall Season Foretell of 2018? The fall season has been strong, and while the new mortgage rules will suppress demand for more expensive homes, and condos, those under $600,000 will be high demand. That will push prices up. So although some homeowners are pannicking and dumping their houses on the market, demand in 2018 will gobble them all up. Let’s not be distracted by the $3+ million dollar homes in Forest Hill and Mount Pleasant. The Toronto condo market is sizzling hot and they’re running out of condos. It’s a simple matter of supply versus demand in Toronto and Vancouver. The only solution is to end anti-development legislation. Vancouver and Toronto have been designated high growth super cities with large numbers of immigrants with visas and foreign students arriving every month. How can that be stopped now? If Trudeau and Wynne try to counter rising prices and demand for homes brought on by demographic and economic factors, via policy changes, it may create a bubble and then housing crash in Toronto and Vancouver, cascading right across the country. In fact, it’s likely that they’ll both be run over be the economic train neither had any part in creating. For Trudeau, it is hypocritical to recruit a million new immigrants and then not help withh the housing crisis. I think he’ll come around because of this. However, it still leaves the BC and Ontario premiers left blockading the housing highway. For those who don’t want to live in these modern mega cities, there are other areas of Canada to live. The north is undeveloped, but as more babyboomers tire of the congestion of the city, they’ll be looking for homes, at least for 6 months of the year, in Canada. They may have to go north to find one, if anyone’s building up there. And they won’t find much relief in Muskoka, Niagara Falls, Kelowna, or Victoria. Prices are up in most retirement cities and they’re rising in Costa Rica, Mexico, Florida and Arizona. Too many people bidding on too few properties. Simple math that seems to befuddle politicians. Before buying a home or investing in rental income property, get some advice on maximizing your investment. The path you take might be surprising. Expand your search for homes for sale with an intelligent strategy that does more than calling a Realtor. Before you sell, consider advanced selling tactics that can capture the full interest in your home. The demand for your home or condo is out there in the real marketplace. They just aren’t aware of your property. 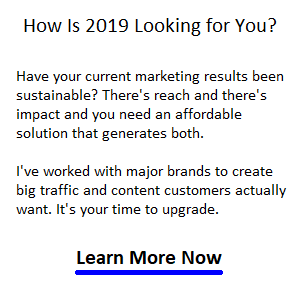 Marketing is worth many times what you pay for it. Consider the exposure of your property on Google, Google adwords, Facebook ads, in addition to your MLS listing. Don’t be timid. Power it up! Related Posts: Toronto Real Estate | Rental Income Property | Student Housing REITS | Toronto Condo Boom | Toronto Housing Bubble | Calgary Real Estate Predictions | Vancouver Housing Report | Auto Insurance Quotes Toronto | Compare Auto Insurance Vancouver | Solar Power Systems | Future of Real Estate | Mortgages | Digital Marketing Toronto | Digital Marketing for Realtors | SuperBowl 2018 Picks | Real Estate Marketing | Vaughan Real Estate Market | Mississauga Real Estate Forecast | US Housing Market | US Stock Market Crash 2019? See predictions for 2019 housing markets. Boston, Chicago, Philadelphia, Tampa, Atlanta, New York, Miami, Houston, Seattle, Los Angeles, San Diego, Seattle, San Francisco Bay Area are stable and positive for 2019. There’s concern but the likelihood of a housing crash is low. When is the Best Time to Buy?. Spring is an interesting time to buy or sell. Read these 14 ways to sell your house for more. Please share this post generously and keep your friends and clients informed.